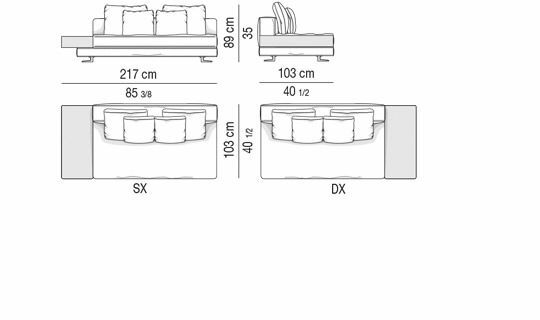 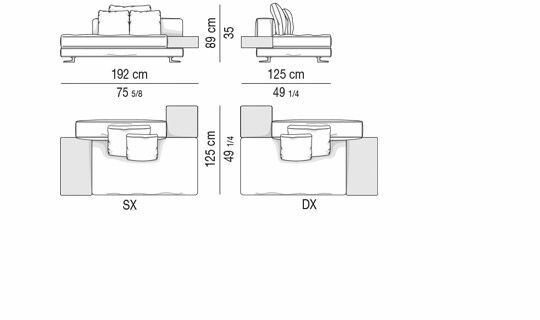 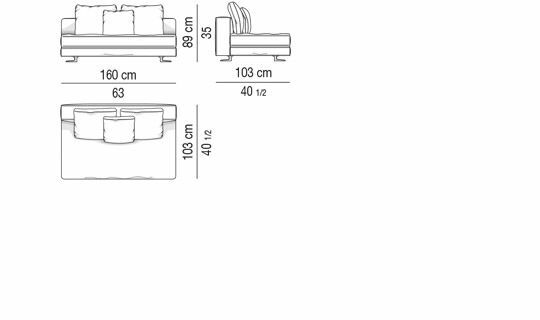 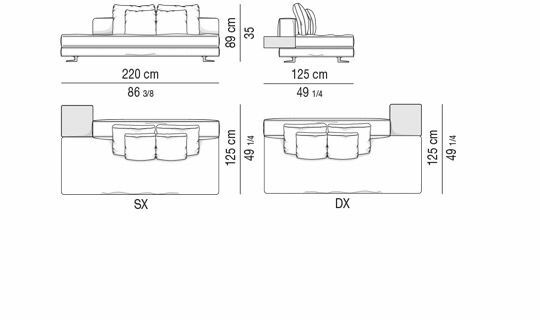 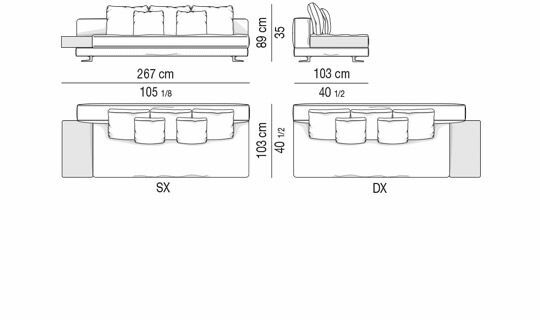 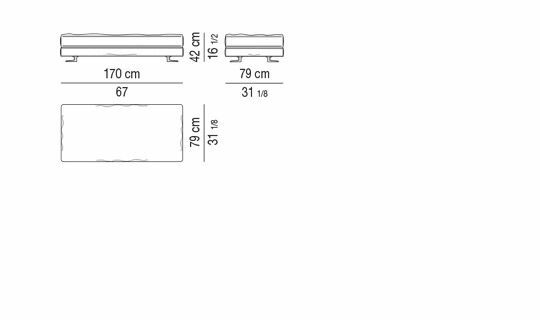 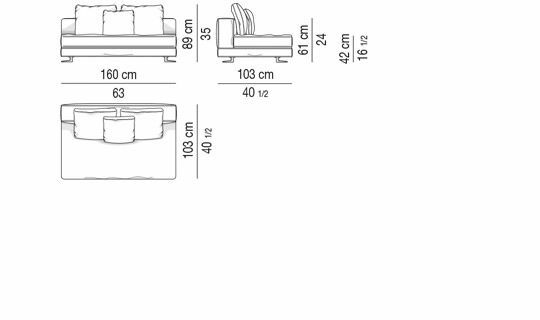 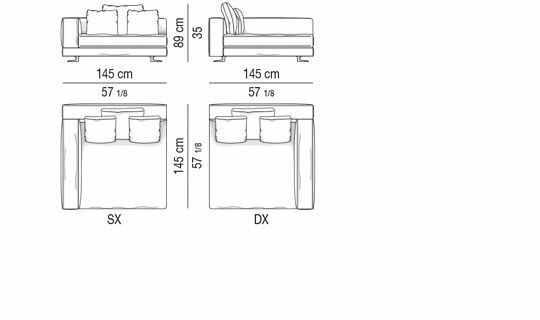 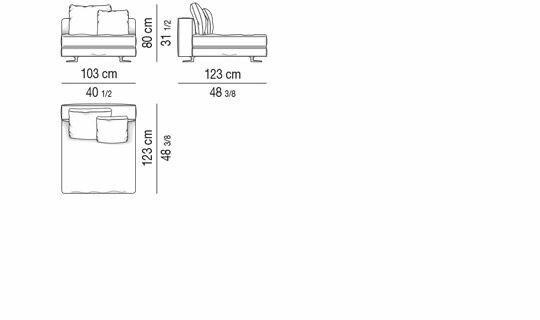 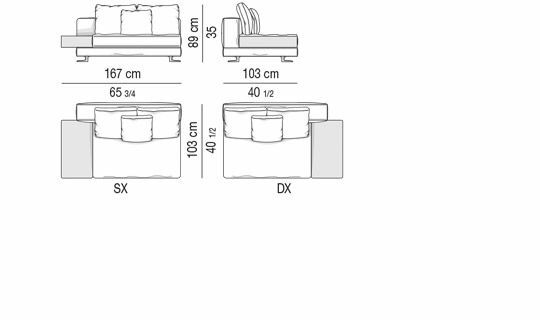 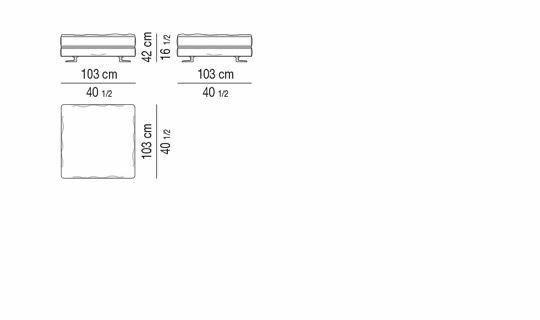 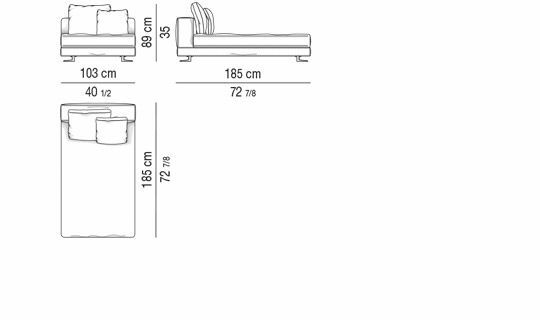 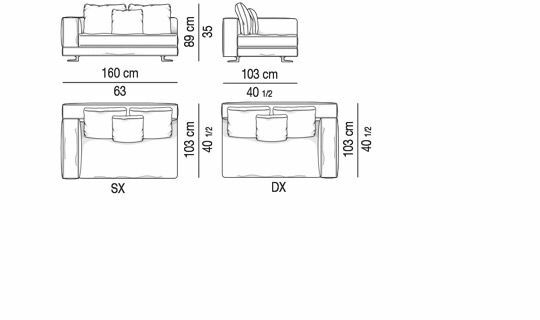 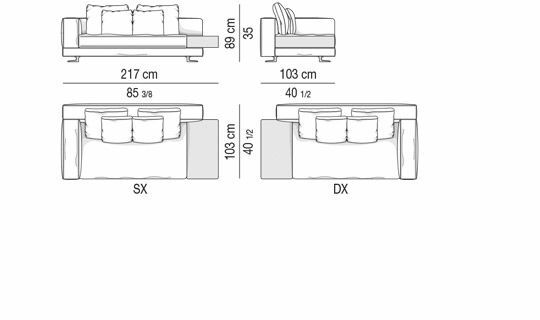 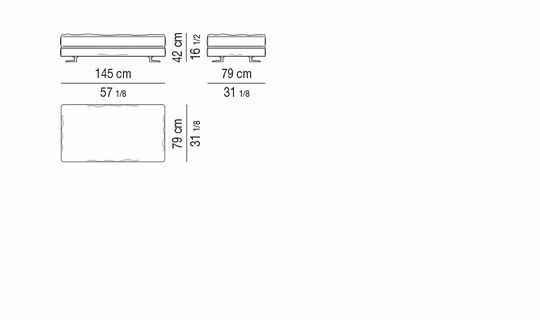 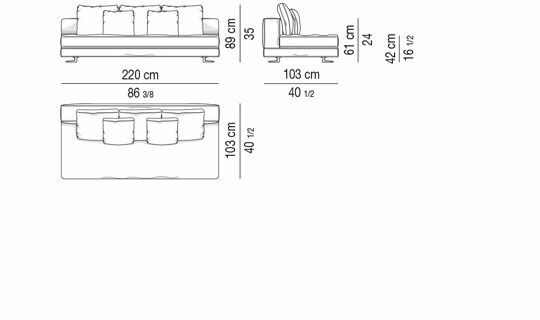 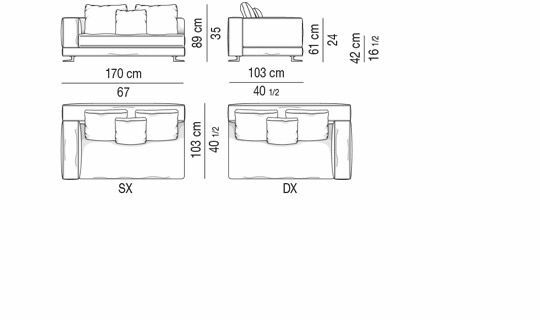 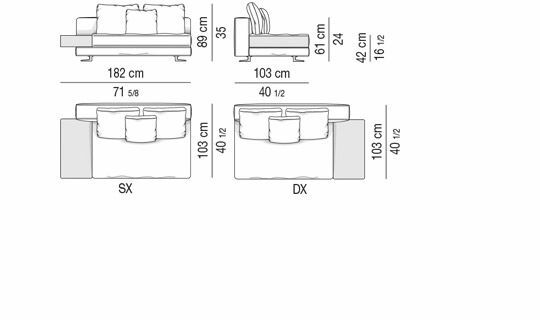 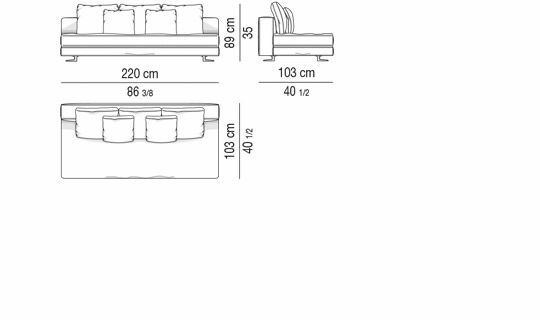 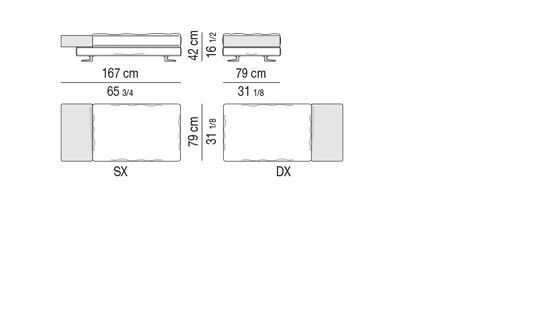 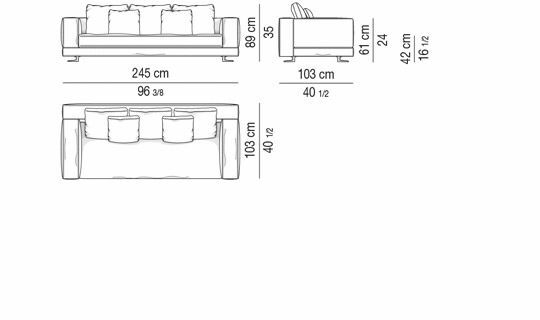 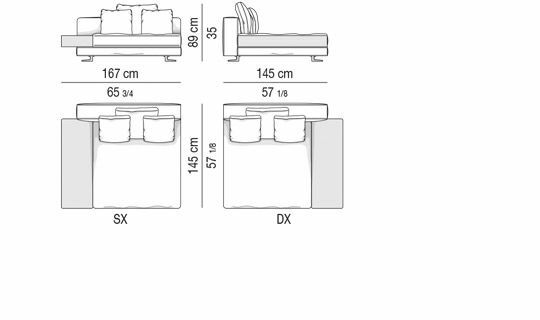 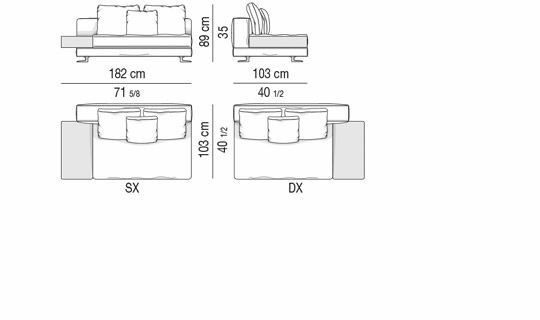 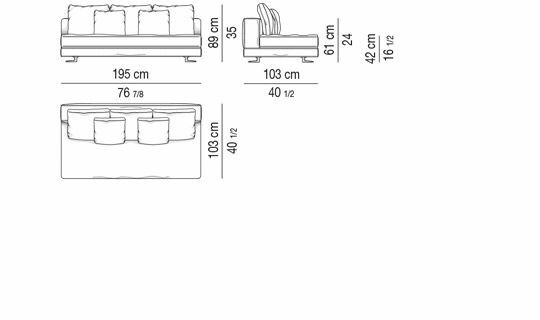 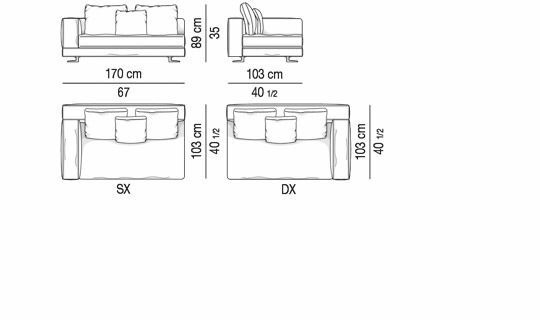 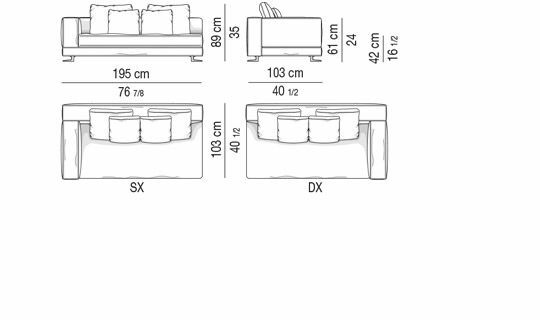 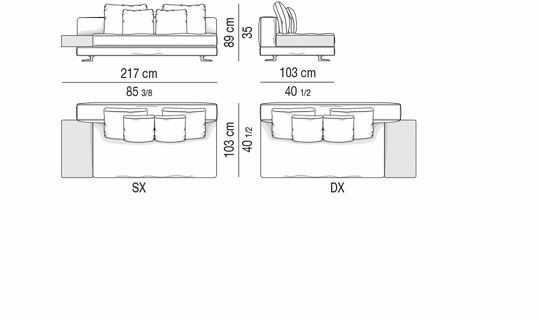 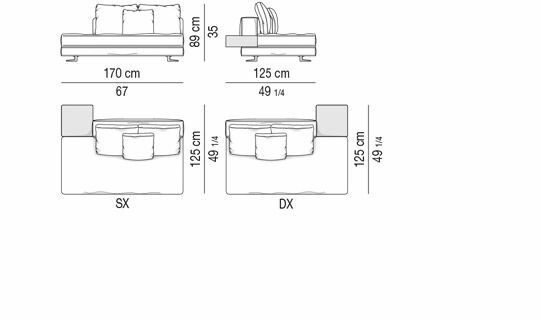 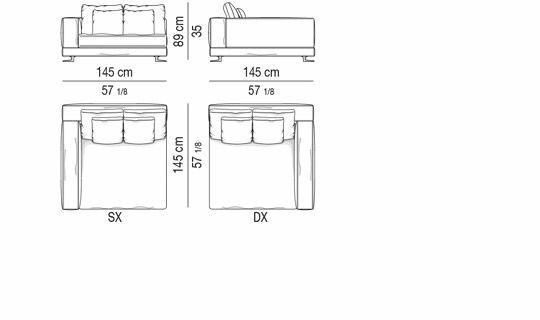 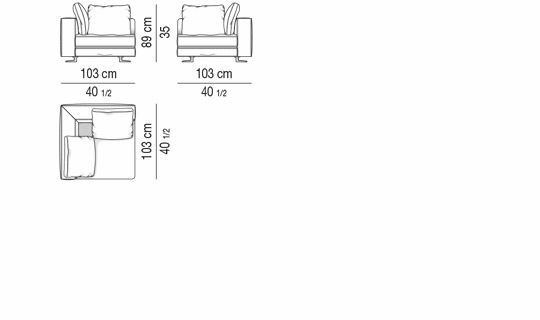 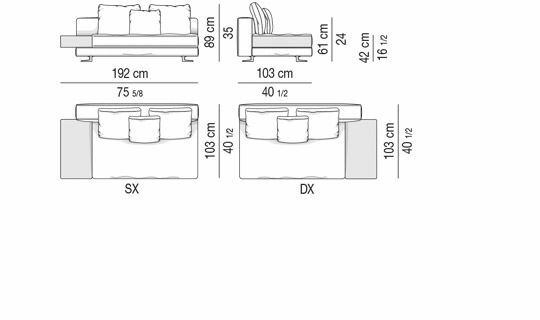 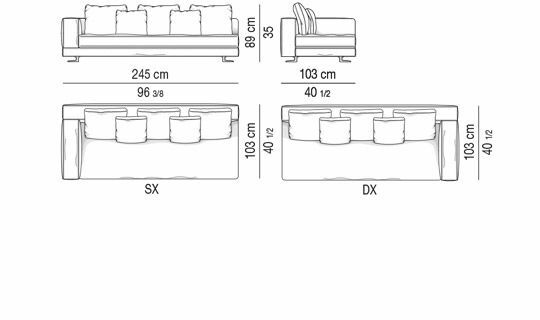 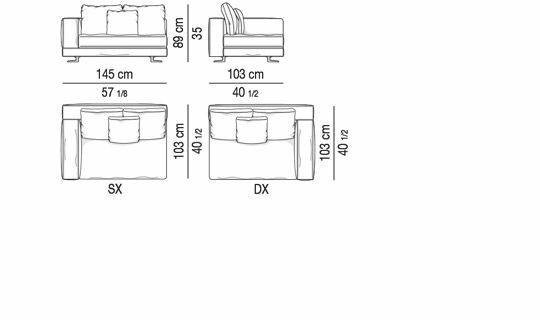 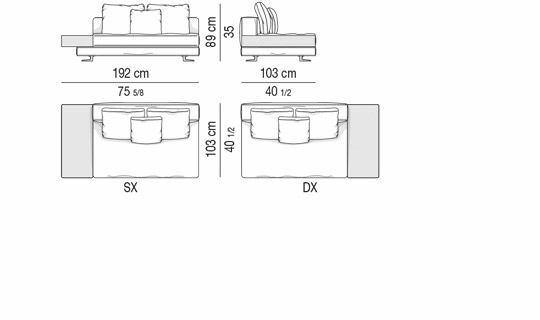 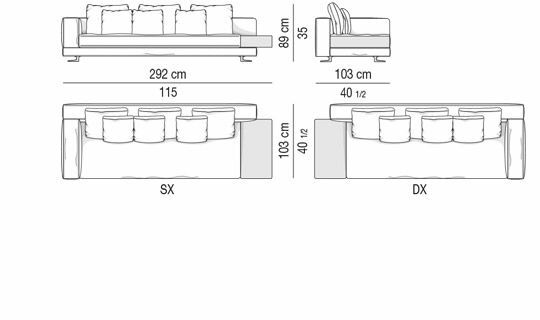 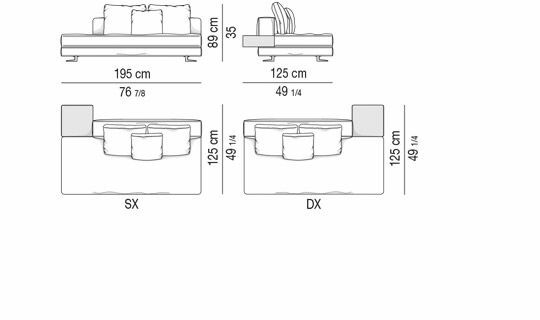 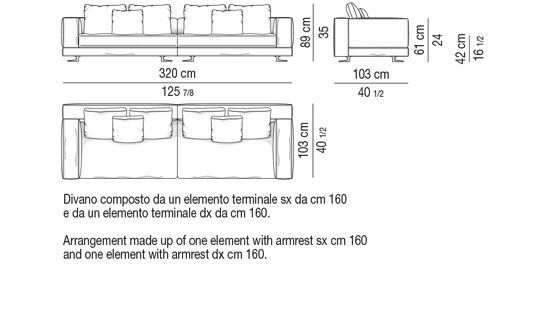 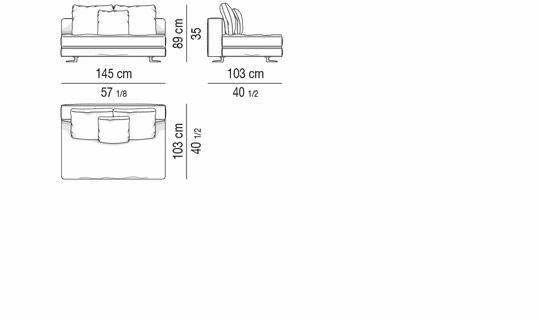 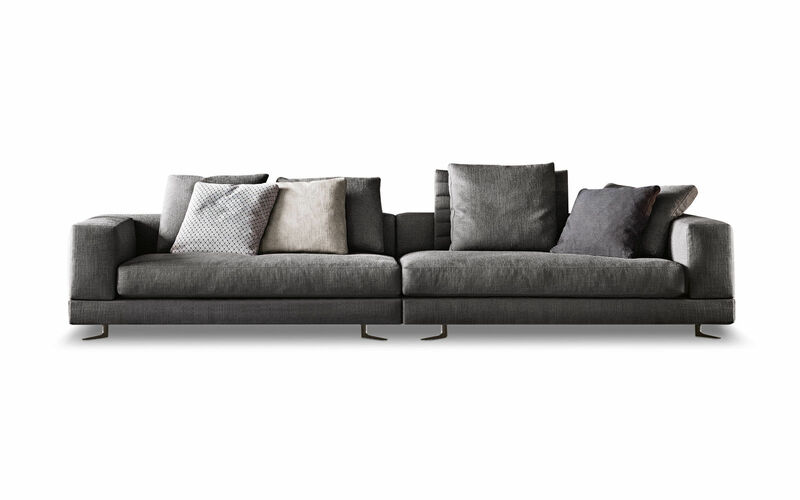 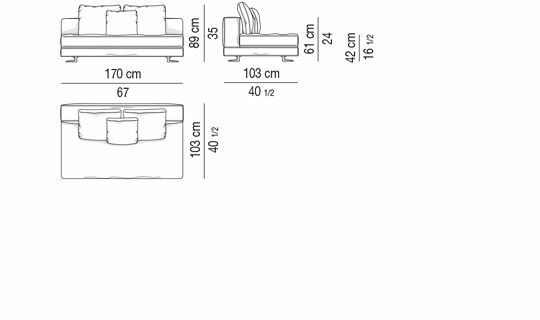 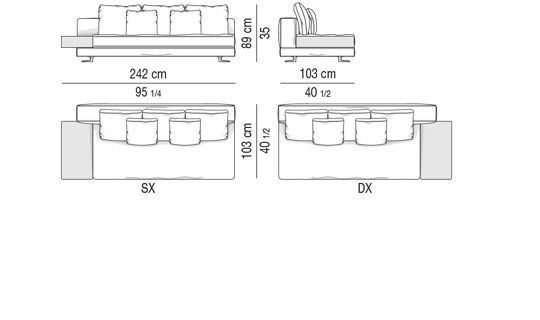 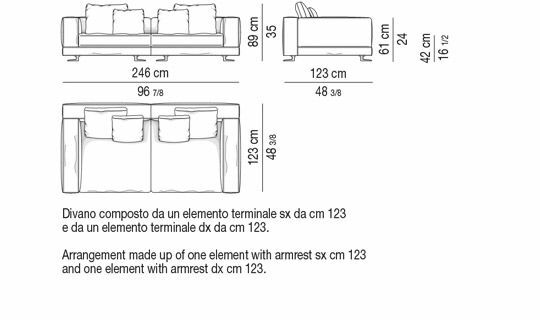 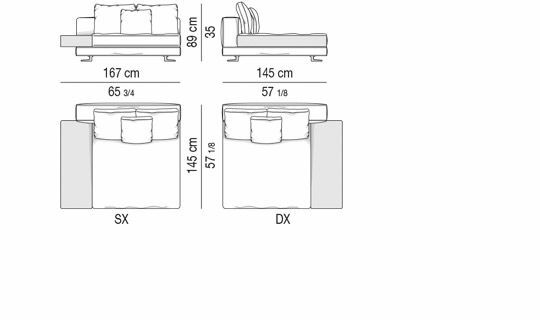 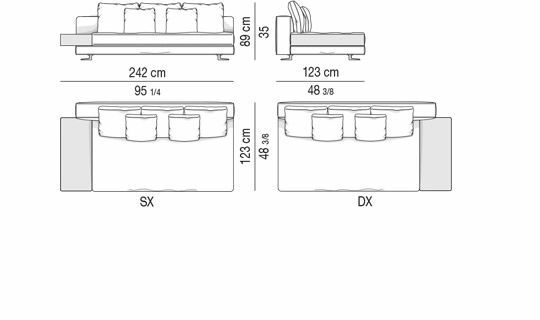 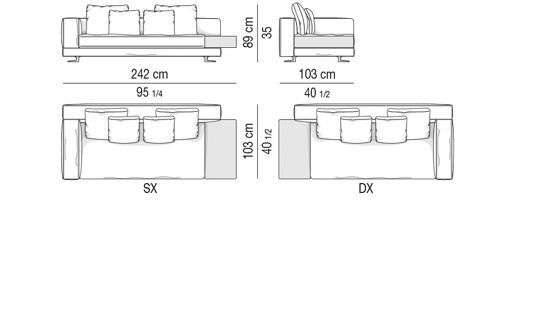 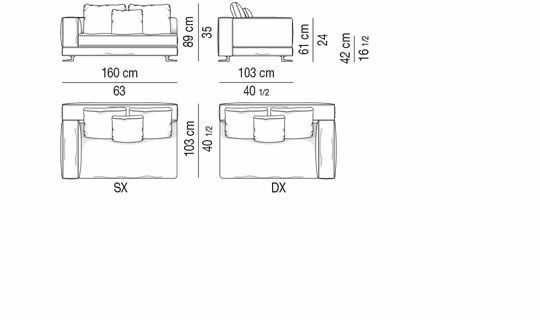 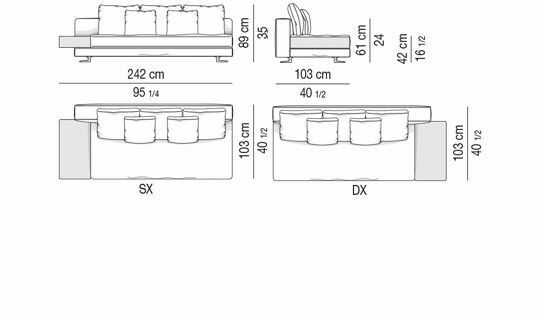 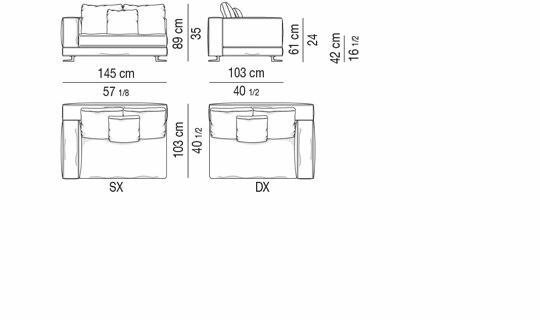 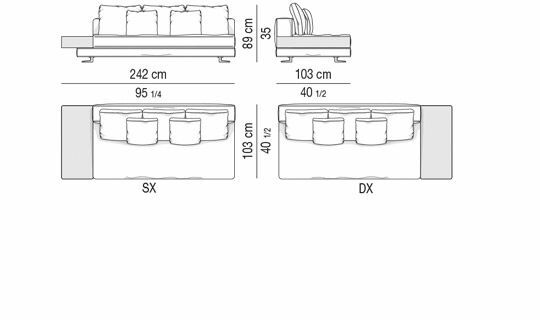 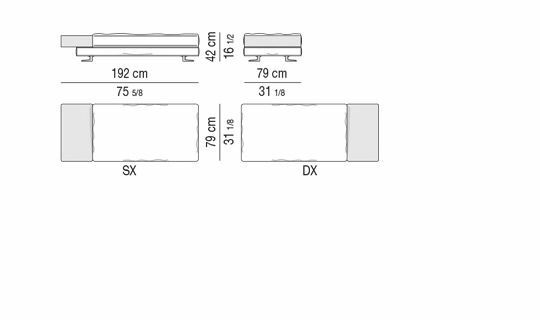 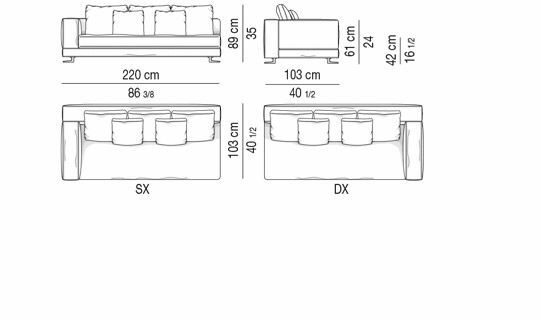 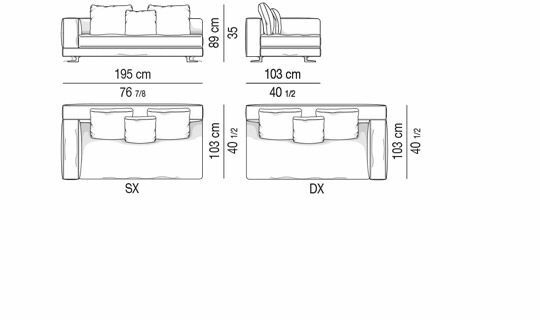 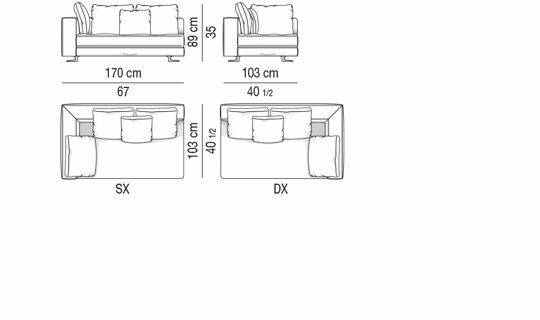 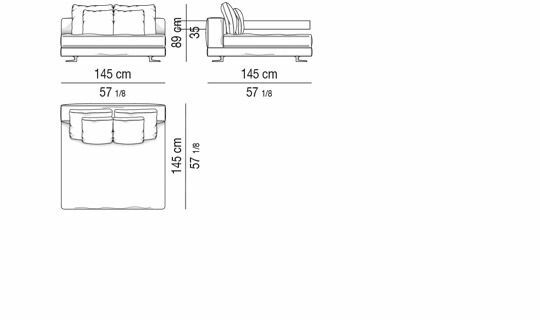 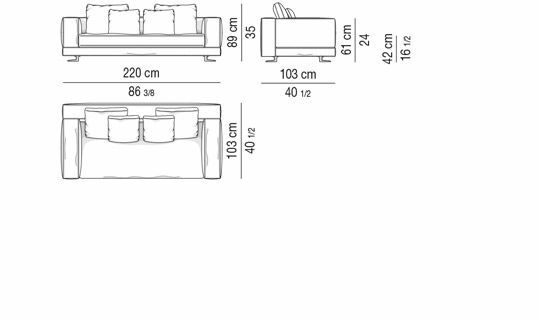 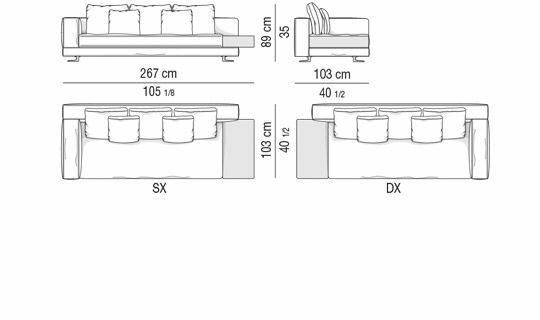 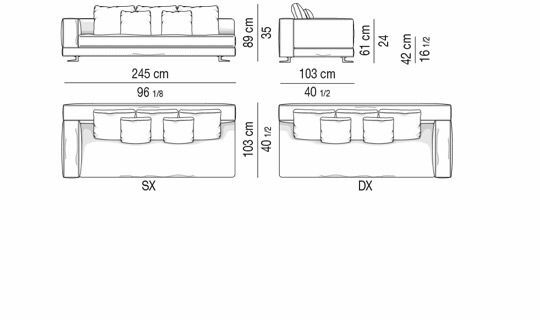 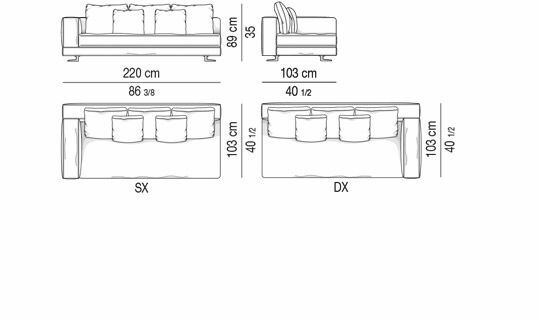 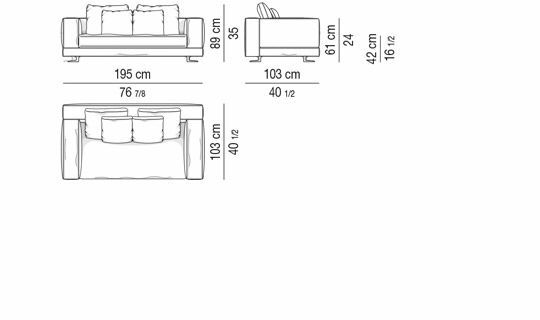 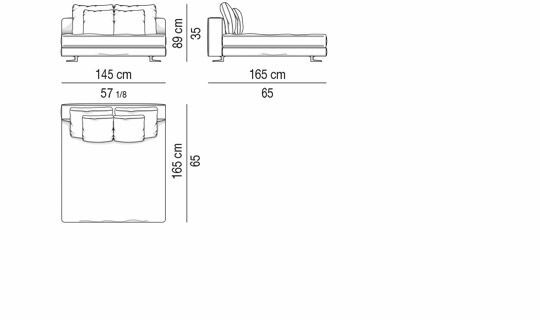 Structure and proportions usher in a new architecture of the sofa. 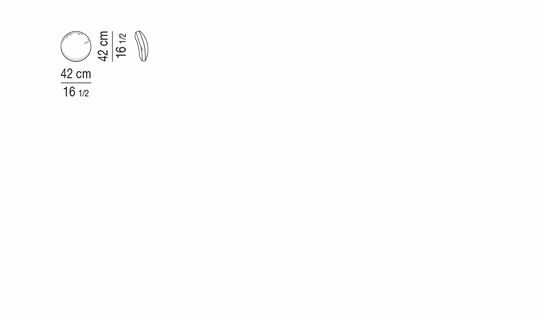 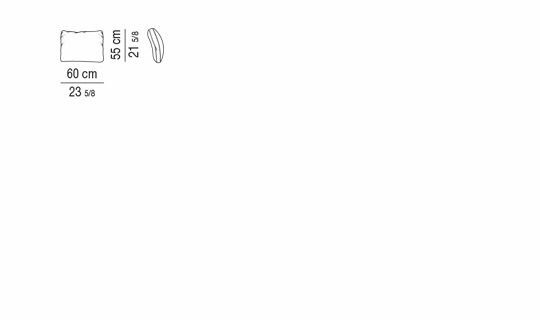 White seems to be a composite of perfectly balanced shapes. 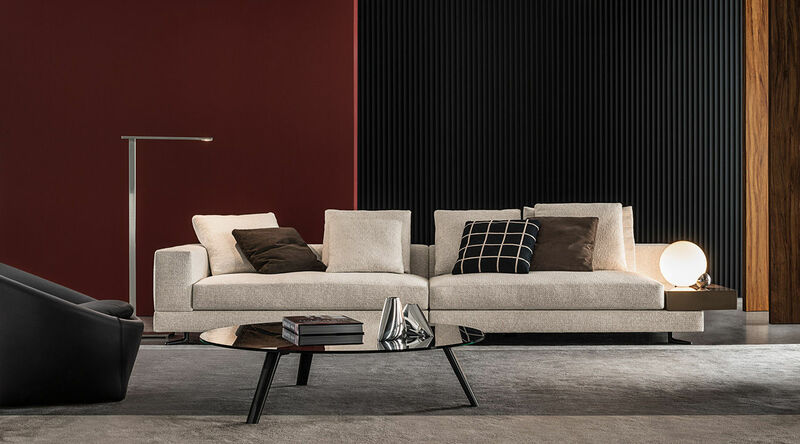 The repetitive overlapping of horizontal lines forms a highly distinctive aesthetic pattern that is further emphasized by the use of several different materials. 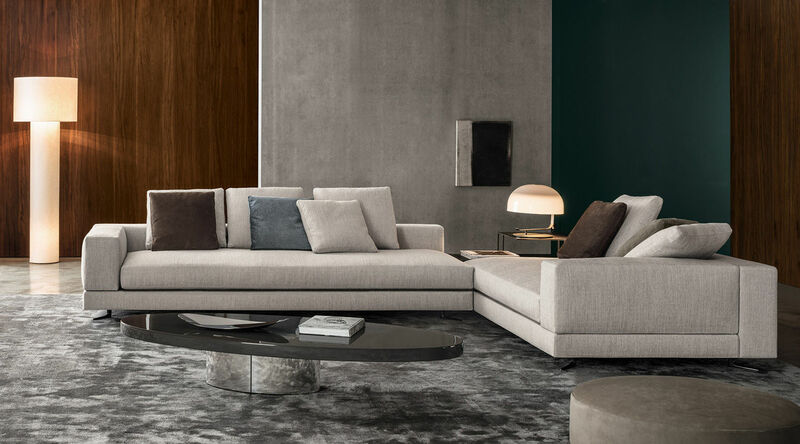 The sofa base can be upholstered in fabric, leather or saddle-hide upon which the seat backs, cushions and tray tops are placed to create a captivating interplay of shapes and alternating positive and negative spaces. 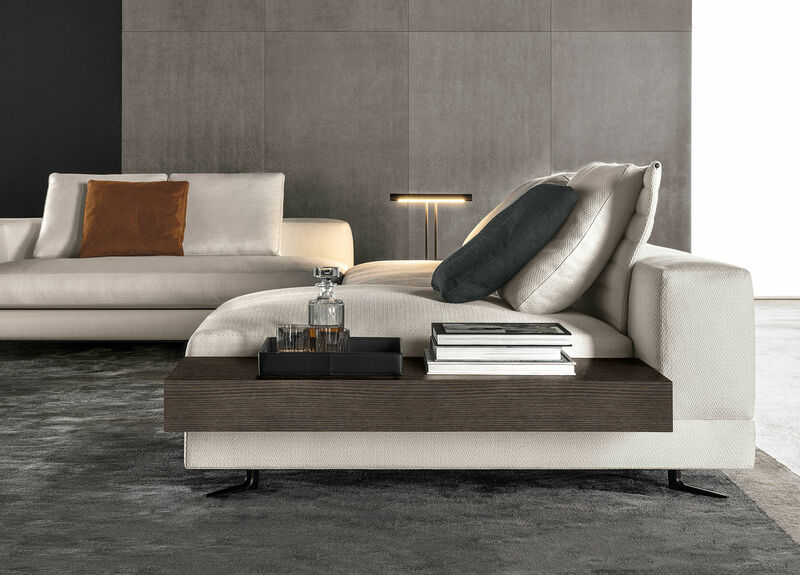 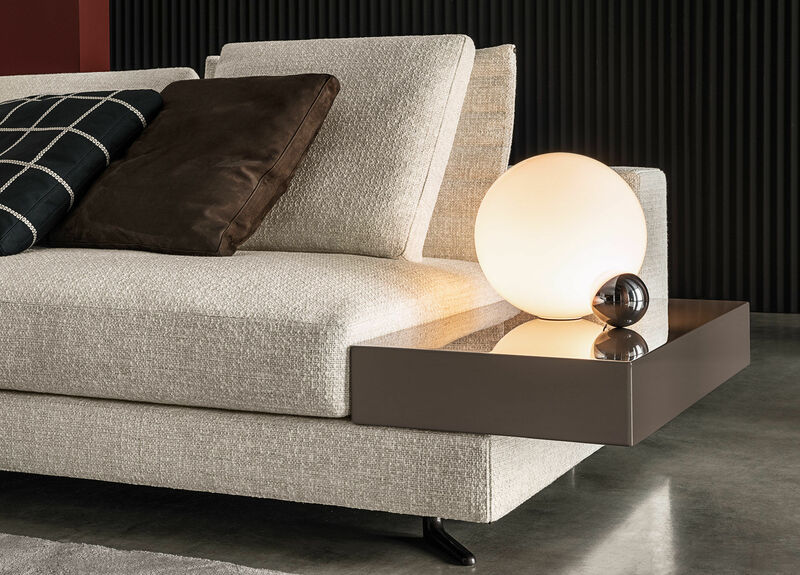 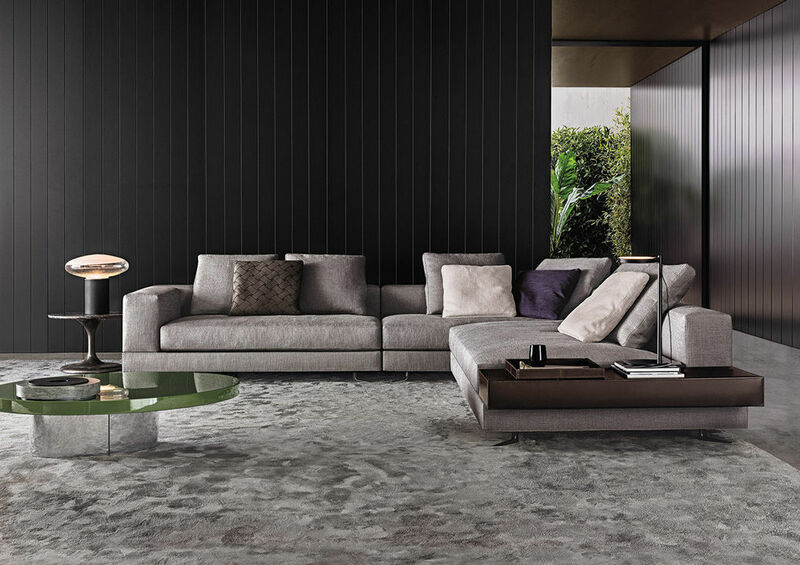 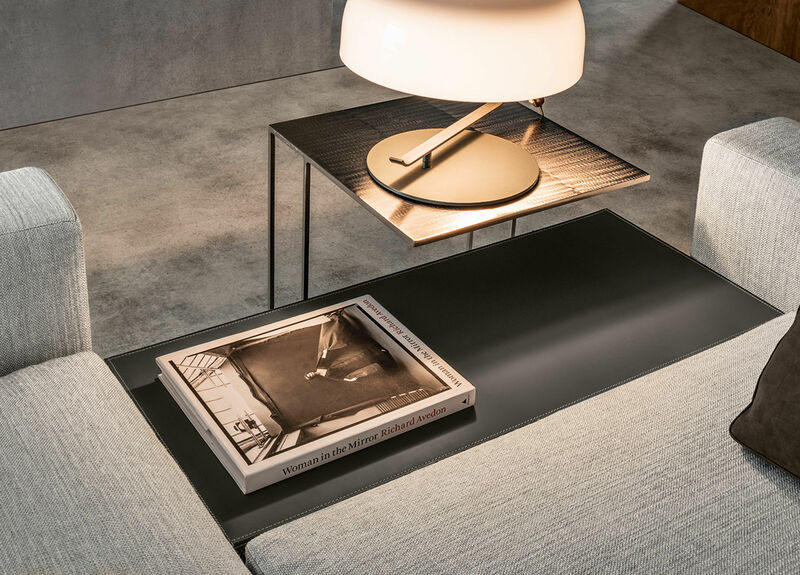 The sofa sits on die-cast aluminum Pewter-colored feet, an exclusive design by Minotti Studio, that are set at a 45° angle to the sofa corners, lending added flair, even to larger-sized compositions. 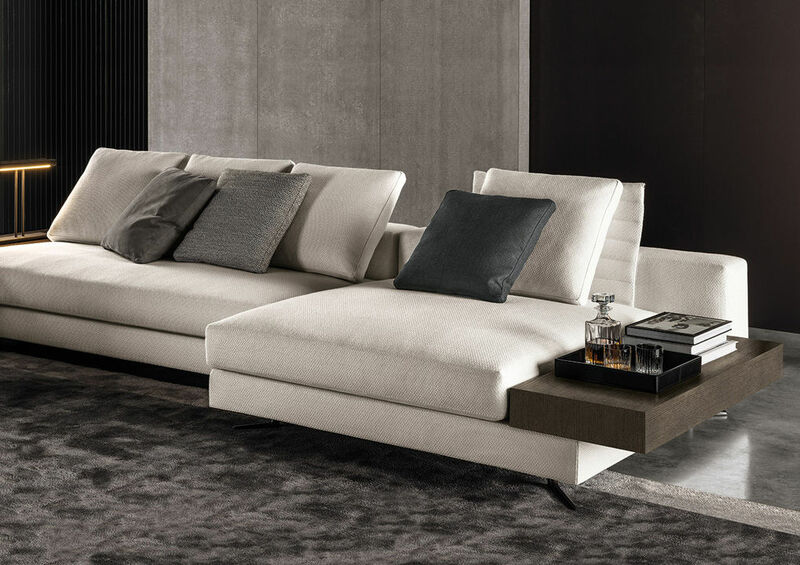 To make the White sofa even more welcoming, the padding in the cushions was enhanced with a deeper layer of goose down, making them luxuriously soft and creating a pleasant contrast to the sleek formality of the sofa base. 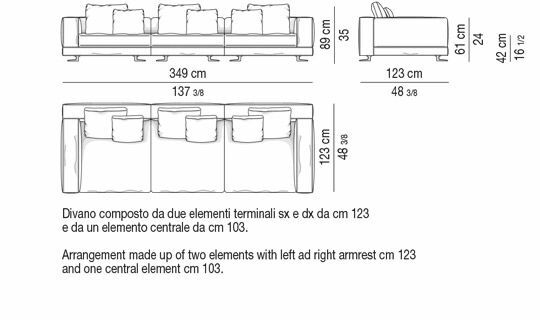 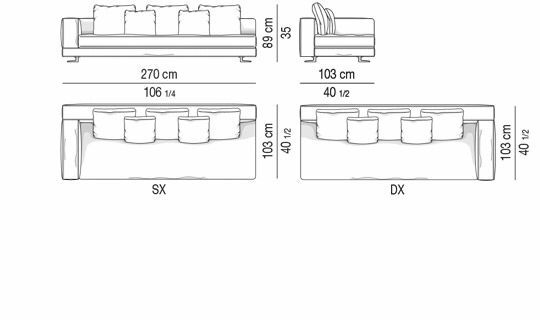 A unique advantage of the White seating system lies in the option of adding tray tops in place of the armrest or, for White Sofà, also along the seatback, making it possible to create particularly functional compositions. 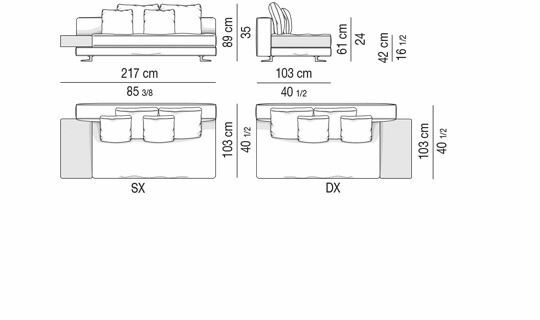 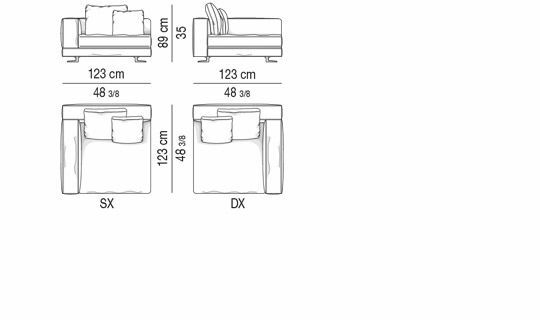 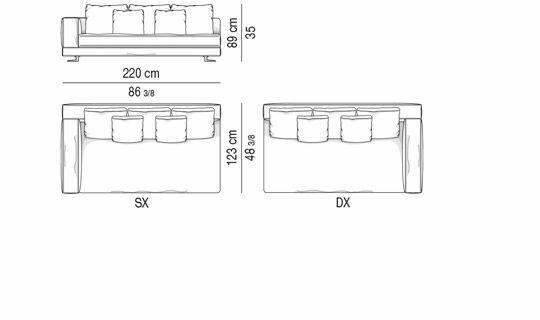 Shaped like rectangular boxes, they have the same depth as the sofa base and come in many finishes – Mud, Tobacco, Dark Brown, Grey and Black saddle-hide; glossy lacquered finish in Sand, Mud and Granite; or wood veneer in Ebony with open-pore matt lacquer; Oak with open pore Tobacco or Grey stain finish; and Oak with open pore Moka or Black lacquer finish. 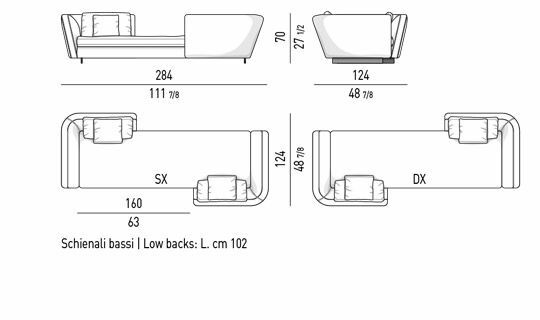 Multi-ply wood, seat suspension is provided by elastic straps with a high rubber content. 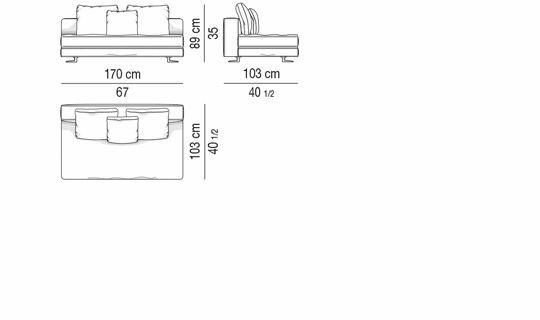 Variable-density resilient polyurethane foam padding. 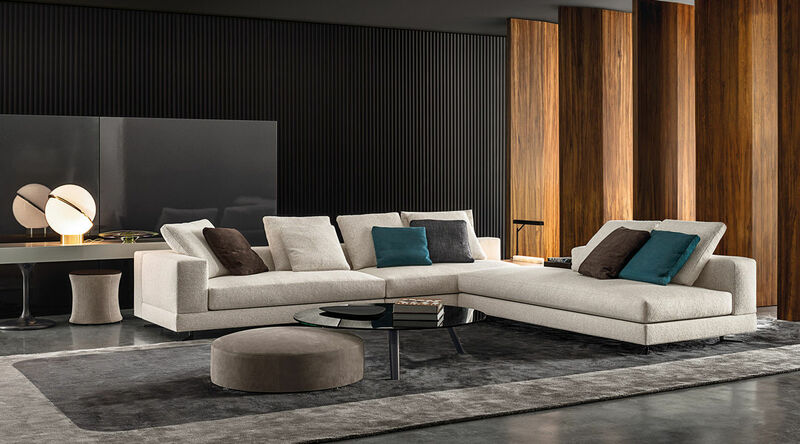 The sofa armrests and backrests are covered with a channeled goose down quilted padding that enhances the softness of the upholstery. 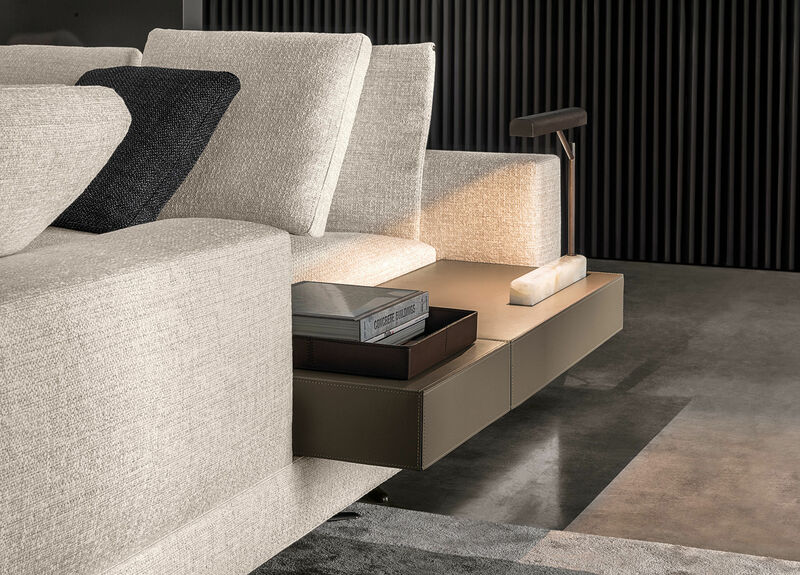 Reversible seat cushions with variable-density resilient polyurethane foam core and channeled goose down surround. 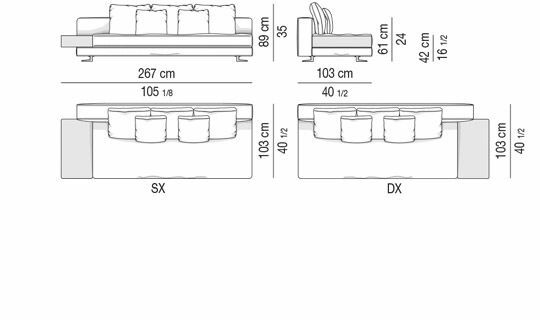 Back cushions with polyurethane foam core and channeled goose down surround. 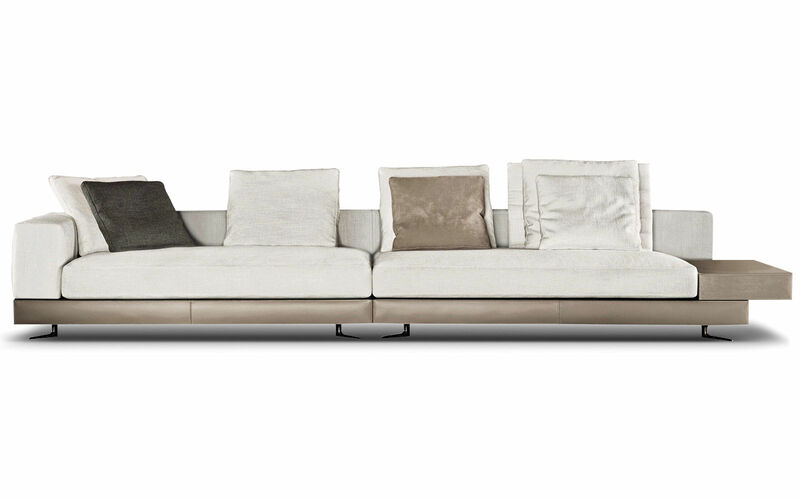 Completely removable for the seat, back cushions and structure in all the versions (fabric, leather and saddlehide). 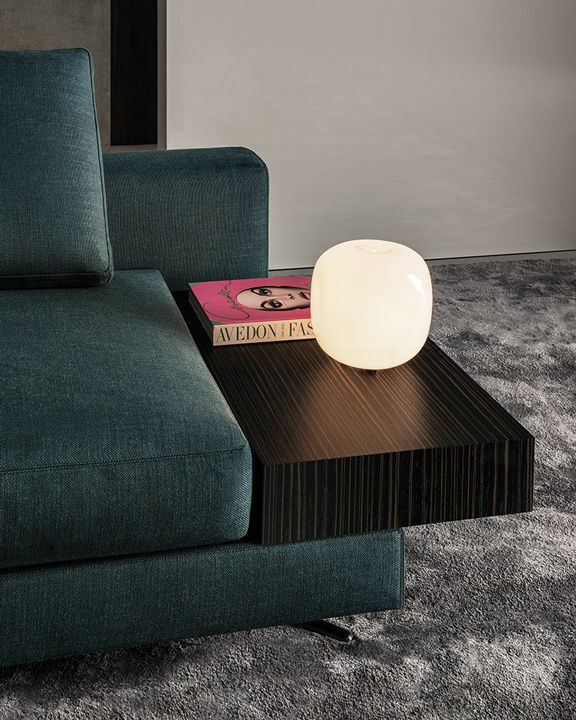 Molded aluminum die-cast feet (exclusive design by Minotti Studio) with extra-glossy, anti-touch Pewter coloredfinish. 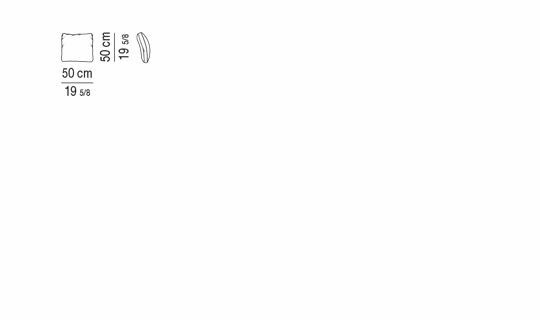 Protective Hytrel® glide (soft, scratch-proof rubber). 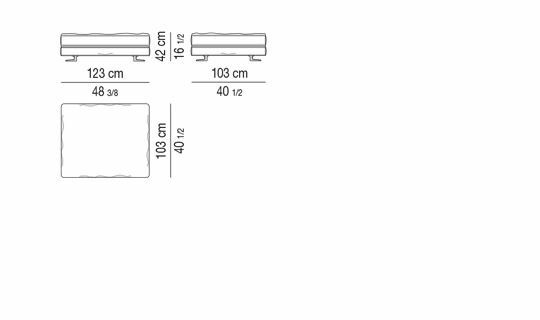 MDF frame assembled at 45° with beveled corners. 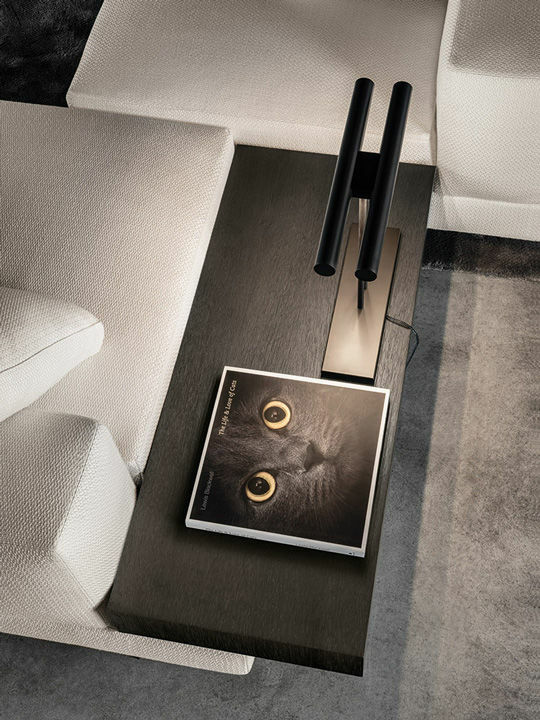 Glossy brushed Sand and Granite-colored finish. 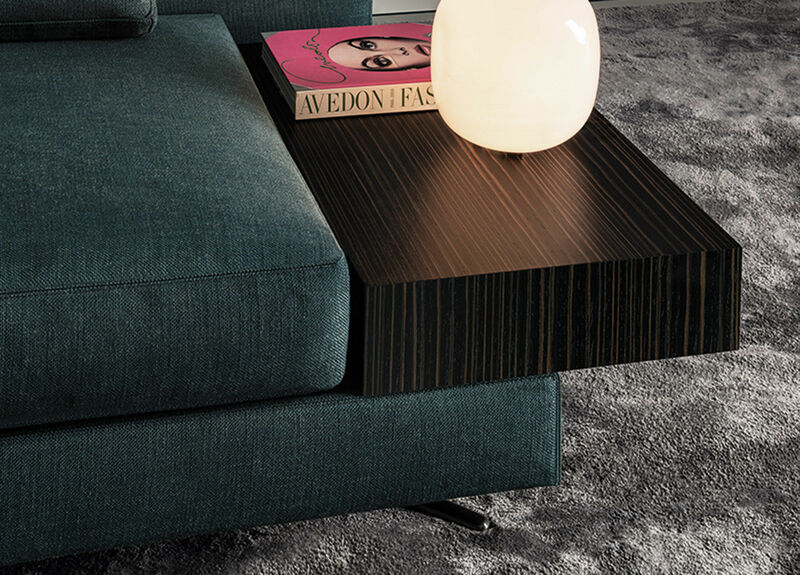 Wood frame with a thin polyurethane padding and covered in saddle-hide in Mud, Tobacco, Dark Brown or Black. 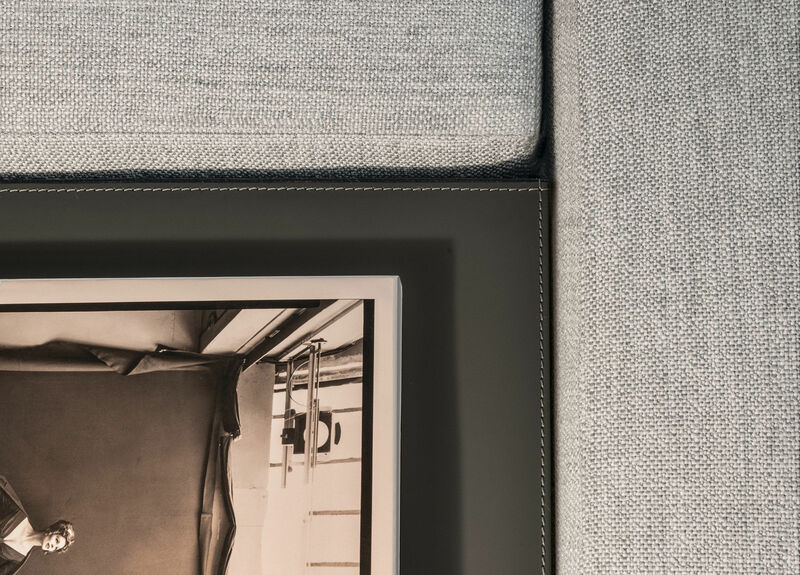 The saddle-hide is enhanced by detailed hand stitching. 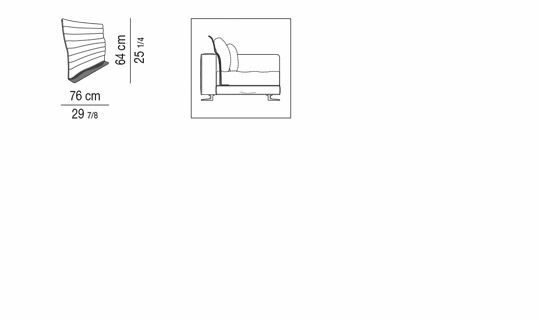 The saddle-hide base features detailed hand stitchings. 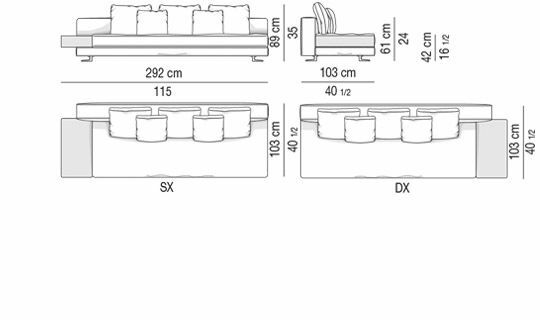 The saddle-hide is avail- able in Mud, Tobacco, Dark Brown and Black.